The Southern Expressway (route M2) is an 18.5 km (11.5 mi) freeway in the southern suburbs of Adelaide, South Australia, between Bedford Park and Old Noarlunga. The Southern Expressway was built as a corridor to relieve heavy traffic from the major arterial, Main South Road, in Adelaide's south. It was originally built as a reversible one way freeway, and was the world's longest after its completion in 2001. Between 2010 and 2014 it was expanded and it is now a regular 2-direction freeway. Construction of the expressway also included the Adelaide Southern Veloway for cyclists, which runs alongside it for 7 km, from Marion/Main South Road to the Panalatinga Tunnel. South of the Panalatinga Tunnel, the bikeway becomes a shared track for the remaining 12 km of the expressway. The expressway crosses over the Coast to Vines rail trail at both Panalatinga Road and at the expressway's Southern end. The expressway is the southern part of a north-south freeway originally conceptualised under the Metropolitan Adelaide Transport Study (MATS), completed in 1965, as a freeway bypassing the city from Dry Creek to Old Noarlunga. 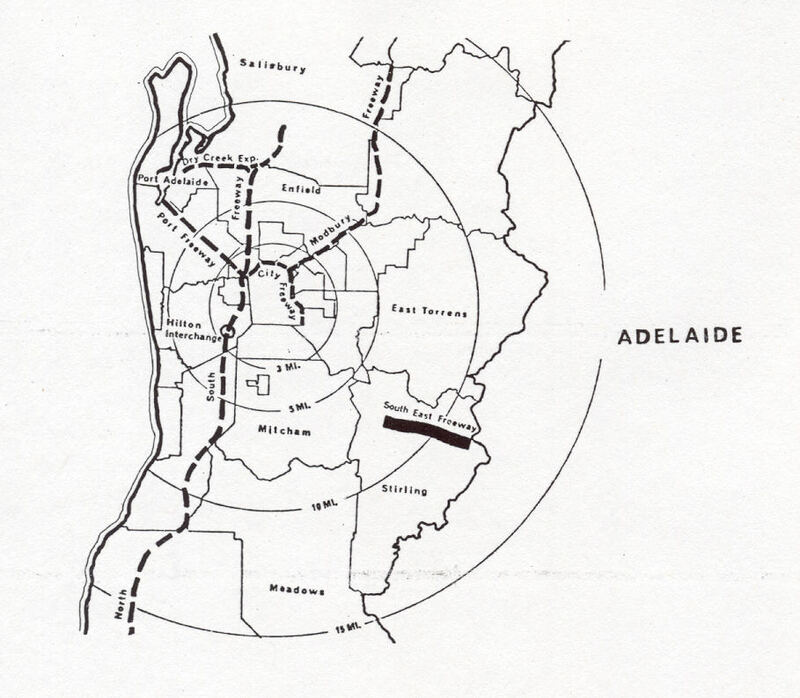 The MATS plan proved unpopular, and in 1971 all further highway construction in Adelaide was postponed for a period of ten years. In 1983 plans for the freeway north of Darlington were abandoned, and the land that had been set aside was progressively sold off. In 1984 the state government announced plans to develop a "third arterial road" for the south. In 1987 the project was split into two phases, the first the upgrading of Main South Road and Marion Road in the Darlington area, and the second a new road from Darlington to Reynella. Phase one was completed in 1994 with the widening of Main South Road to eight lanes between Ayliffes Road and Seacombe Road, and the widening of Marion Road to six lanes between Main South Road and Sturt Road. Phase 2 became the expressway, which was to be constructed in two stages: from Darlington to Reynella, and from Reynella to Old Noarlunga. It was developed as a one-way reversible road with future duplication provided for in the roadworks base, to be constructed when the need arose. It used the remaining "Noarlunga Freeway" reservation, except for the northernmost kilometre where a new route through O'Halloran Hill was chosen to provide high-quality links with Marion and Main South Roads without interfering with existing infrastructure at Sturt. Construction of the expressway commenced in July 1995 and the first stage was opened to traffic on 17 December 1997. Construction commenced on the second stage in February 1999 and was opened to traffic on 9 September 2001. The total cost of the reversible freeway was A$76.5m. During its construction and for some time after its opening, the expressway was promoted via a dedicated FM radio station established by the Department of Transport broadcasting via a low-power FM transmitter in the immediate vicinity of the road. The radio station broadcast a recorded message on continuous loop featuring promotional and community information messages relating to the expressway, including a jingle that Transport Minister Diana Laidlaw declared made the expressway the only road in the world to have its own jingle. Until August 2014, the expressway was open approximately 21 hours per day, one way for over 10 hours in each direction. The northbound (city-bound) direction occurred on weekday mornings (2:00 am – 12:30 pm) and weekend evenings (2:00 pm – 12:30 am), the southbound direction on weekday evenings (2:00 pm – 12:30 am) and weekend mornings (2:00 am – 12:30 pm). It was closed 12:30–2:00 am and 12:30–2:00 pm, except for Saturday and Monday mornings when the direction remained unchanged. Weekday public holidays also operated under the weekend's opening times to accommodate tourists travelling to the Fleurieu Peninsula. During each closure all road signs, lights and boom gates changed over, and the road was inspected by a tow truck contractor for debris and car breakdowns. In 2007 the Howard Government pledged $100m towards widening the expressway in its unsuccessful re-election bid. On 17 February 2010, during the state election campaign, Premier Mike Rann announced that, if re-elected the expressway would be duplicated in a A$445m project. However, the inclusion of a new A$75m interchange at Darlington was later scrapped, after the government planning for a major transport hub at Darlington discovered the need for a $50 million section of road that would have to be destroyed when the expressway was eventually duplicated. Once duplication was announced in 2010, construction started one year later in 2011. The first construction-related expressway closures were 3 consecutive days in January 2012, out of peak hours, but is the most disruption the road has experienced since the opening of Stage 2, with only day-long resurfacing of line-marking, and cycle rides disrupting the expressway previously. Due to the duplication of the Expressway, all of the bridges had to be widened to meet the new width of the road. Some road bridges were closed during the work needed, and others required a temporary lower speed limit for safety reasons. This caused some anger to residents and businesses. The new road was built entirely on the western side of the original roadway, and is four lanes wide between Reynella and Marion Road in the northbound. Accessibility has been improved with the project, with completely new intersections at Beach Road and Sheriffs Road, as well as being able to left turn out at Old Noarlunga, right turn out at Marion Road, and left turn in at Marion Road. 0.0 Main South Road no left turn in from South Road. ^ "Southern Expressway". Government of South Australia. Archived from the original on 3 May 2013. Retrieved 3 November 2013. ^ PM's $100m pledge, Mark Kenny, The Advertiser, 18 August 2007. ^ "New Southern Expressway freeway Darlington interchange scrapped". AdelaideNow. 22 August 2011. Retrieved 22 August 2011. ^ "Southern Expressway flows in two ways". The Times, Victor Harbor, Fairfax Regional Media. 5 August 2014. Retrieved 5 August 2014. ^ "Property Location Browser" (Map). Property Location Browser. Government of South Australia. Retrieved 8 March 2016. ^ a b Google (8 March 2016). "Southern Expressway" (Map). Google Maps. Google. Retrieved 8 March 2016. This page was last edited on 3 April 2019, at 10:30 (UTC).